Jack Hulbert is all jutting chin and silly expressions as he pursues villainous Ralph Richardson and rescues 1930s scream queen Fay Wray. Produced by Michael Balcon and co-scripted by Sidney Gilliat, the film also has a sly dig at Alfred Hitchcock's fondness for finales at a famous landmark. 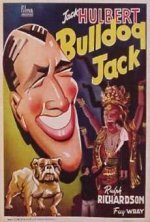 British comedies have rarely travelled well across the Atlantic, but none has been so mistreated as this Gaumont spoof on the Bulldog Drummond myth, which was shown in the States as a straight thriller with all the gags removed! In his only screen teaming with his brother Claude.